Sol Campbell talks to The News during his visit to Fratton Park on Saturday. 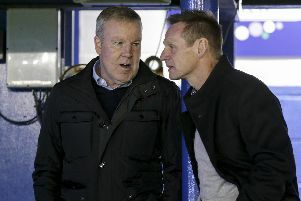 The FA Cup-winning skipper watched Pompey beat Bury 1-0 at Fratton Park as a guest of owner Eric Eisner. Campbell is eyeing a return to the game in a coaching capacity following a successful spell in the Trinidad & Tobago set-up.